My friend Carol owns a home in Keene and invited me for a weekend of rest, relaxation and bug bites. We started our Saturday morning with a visit to Stonewall Farm (no connection to Stonewall kitchen). It is a nonprofit working farm and educational center, including an organic dairy. 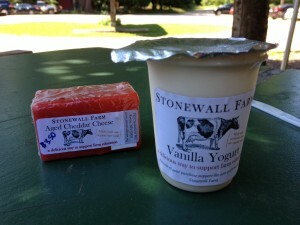 We were able to purchase raw milk cheddar, farm made vanilla yogurt and a pint of just picked strawberries for our breakfast. I also got some local honey for myself. The yogurt was thick, creamy and luscious. 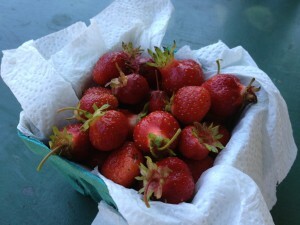 The strawberries were the size of a large marbles; red gems bursting with sweet juice. They were perfect for eating with the yogurt. The cheese was also delicious. 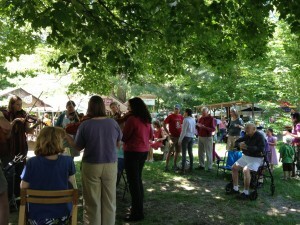 Next, we drove in to Brattleboro, VT where they have a weekly farmer’s market on Saturdays. There are a ton of vendors; mostly fruits and vegetable, but some crafts, cheese and other items are also available. There is an array of food stalls, including a surprising number of Indian offerings. We tried a sampling of food, including artisan bread, cauliflower dumplings, samosas, spring rolls and chicken satay. To be honest, none of the food was amazing, but it was a fun market to wander though all the same. Fritz’s a causal eatery serving salads, paninis, and Belgium fries. You order at the counter and then find a table among the eclectically furnished restaurant. We sat in oversized armchairs, overlooking the indoor tent space. They have live music during some evenings. 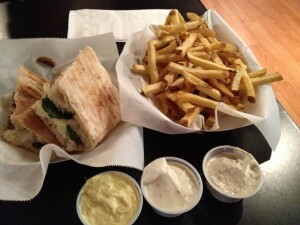 We shared the sausage and spinach panini ($6.79) - grilled sweet Italian sausage, provolone, baby spinach on ciabatta bread and an order of fries (Med – $4.39). There are a dozen sauces available; we sampled the Curry Pineapple, Parmesan Peppercorn, and Rosemary Garlic ($1.69 for 3). The sandwich was tasty – a nice balance of flavors on good bread. The fries were excellent and we loved the dipping sauces, especially the curry pineapple. The portions were generous and very affordable.